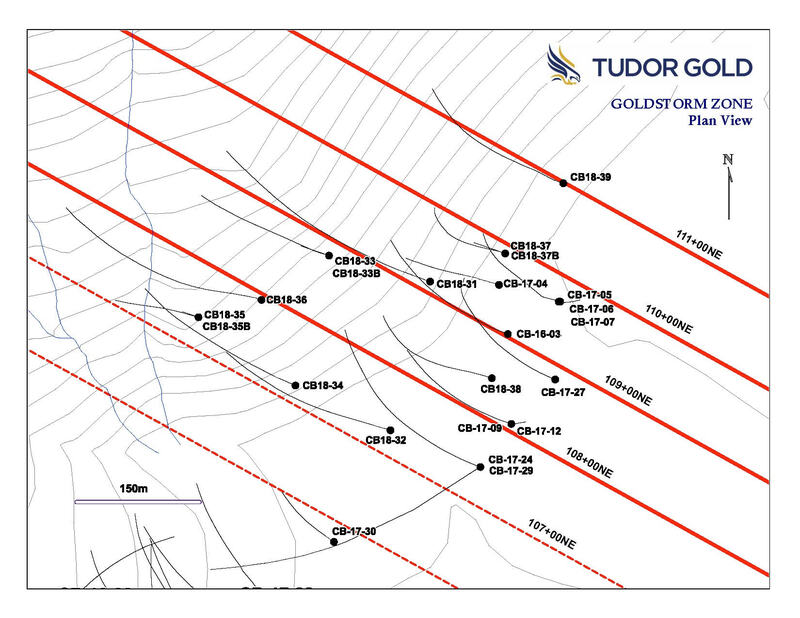 TUDOR GOLD Corp. (TSXV: TUD) (Frankfurt: TUC) (the “Company” or “Tudor Gold”) is pleased to announce the designation of the new gold zone at Treaty Creek which has been named “Goldstorm”. 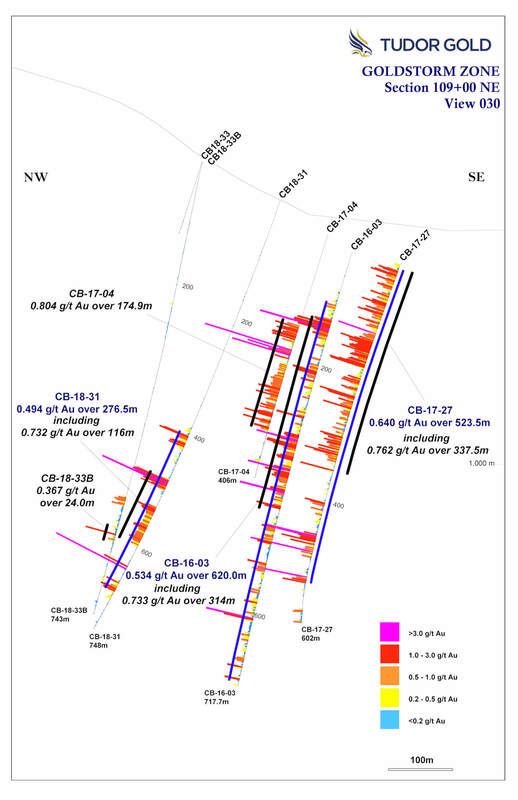 It was previously thought that gold mineralization identified by drilling northeast of the Copper Belle Zone was simply a northeast extension of that same zone, but after evaluating drill hole data from holes completed in 2016, 2017 and 2018, it appears that the mineralization encountered to the northeast of Copper Belle has different characteristics, configuration and geometry. While it is unclear whether the zones are genetically linked, these zones are physically separate. 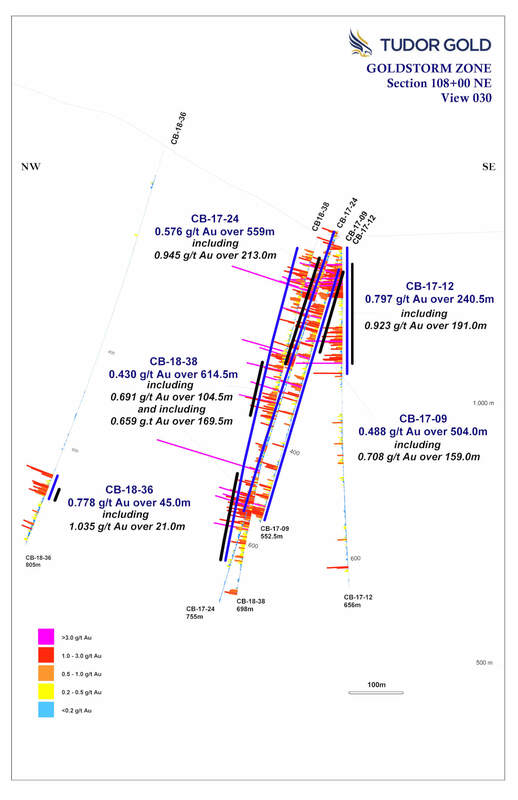 The surface drill hole location map at the end of this news release shows the location of both gold zones. 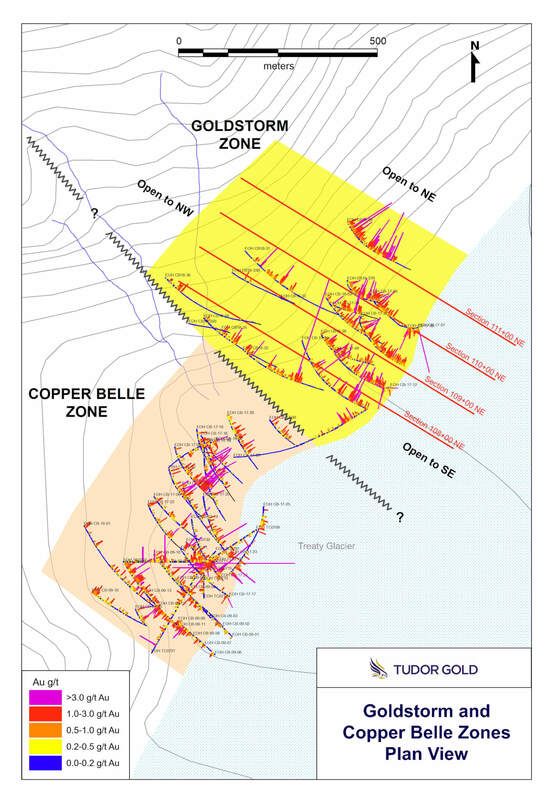 TUDOR GOLD Exploration Manager, Ken Konkin explains: “Goldstorm is a much larger system than Copper Belle, it is at least 300m wide and extends vertically for over 700m. The zone has been traced for approximately 500 meters along a northeastern azimuth. 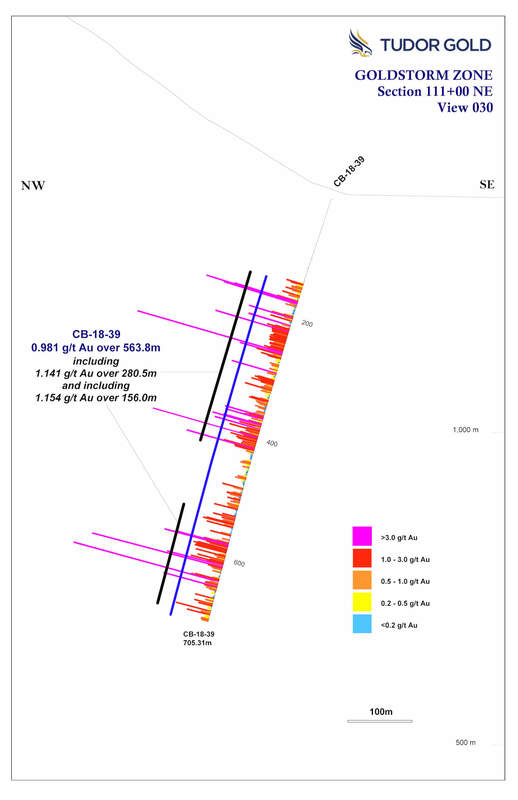 Gold mineralization appears to be continuing towards the northeast and southeast and clearly becomes stronger in the northernmost hole, CB18-39 which returned 563.8 meters of 0.981 grams per tonne gold. 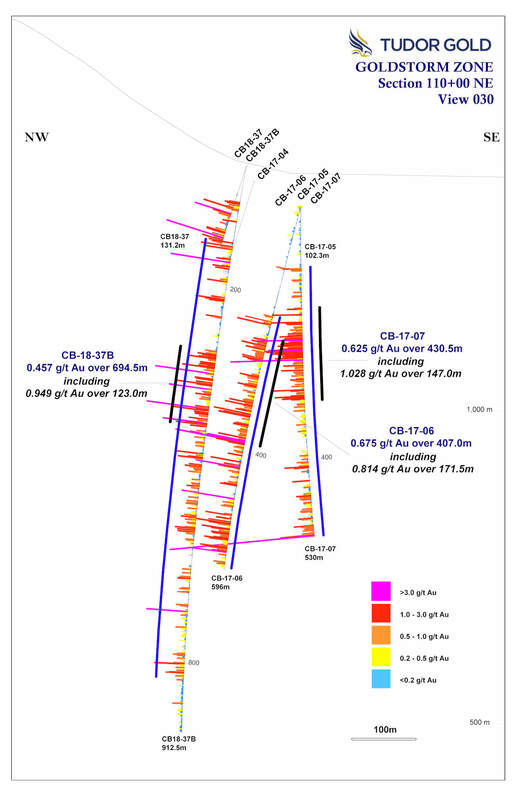 The upper portion of CB18-39 averaged 1.141 gpt gold over 280.5 meters and a lower zone in the same hole averaged 1.154 grams per tonne gold over 156 meters. This hole bottomed in mineralization and we will look at the option of re-entering the hole this year in attempts to extend the mineralization deeper. But the primary focus will be to extend the Goldstorm Zone along strike to the northeast and to the southeast as well. DDH’s CB17-06, CB17-07, CB17-09 and CB18-39 all ended in significant gold mineralization. In 2016 and 2017, drill core samples were prepared and analyzed at Activation Laboratories Ltd. in Kamloops, BC. In 2018, drill core samples were prepared ALS Global’s Preparation Laboratory in Terrace, BC and assayed at ALS Global’s Geochemical Laboratory in North Vancouver, BC. Analytical accuracy and precision are monitored by the submission of blanks, certified standards and duplicate samples inserted at regular intervals into the sample stream by Tudor Gold personnel. Activation Laboratories and ALS Global Laboratories quality systems comply with the requirements for the International Standards ISO 17025: 2005. The Qualified Person for this new release for the purposes of National Instrument 43-101 is the Company’s Exploration Manager, Ken Konkin, P.Geo. He has read and approved the scientific and technical information that forms the basis for the disclosure contained in this news release.